South Orange, NJ, February 23, 2017 – If younger people are to set the trend for the future of legalized gambling in America, they are certainly showing support for the concept today. Asked by the Seton Hall Sports Poll this week, “It’s been said a lot of people bet on sporting events anyway, so government should allow it and tax it. It’s also been said legal betting on sporting events is a bad idea because it promotes too much gambling and damages the integrity of sports. Which comes closer to your view?”……. …….46% of Americans stated support for allowing betting on sporting events, while 42% said it was bad idea. This is a substantial increase from 2010 when a Fairleigh Dickinson poll showed 39% of Americans supported it, with 54% saying it was a bad idea. Younger people are twice as likely to say “allow it” than those over 60. There is a clear age trend in support by age group: 67% of 18-29, 48% of 30-44, 42% of 45-59 and 30% of 60+. The poll was conducted February 20-22 among 626 adults across the country on both landlines and cellphones, with a margin of error of 4.0 %. “If younger people carry those beliefs forward, and as they become lawmakers themselves, we could see a major shift in the legality of sports gambling,” noted Rick Gentile, director of the poll, which is sponsored by The Sharkey Institute. But where will the shift occur? A growing number of people, representative of general trends in the US, believe it should be on a state-by-state basis. 70% of all respondents support regulation on a state-by-state basis, with only 21% saying gambling should be regulated by the federal government. When asked this question in November 2014, 61% said state-by-state, and 29% said federal government. The age trend also was also demonstrable on a question of whether it was appropriate for NBA Commissioner Adam Silver’s to call for legalized betting on a strictly regulated basis: 56% of those 18-29 supported his stance as appropriate, 34% of those 30-44, 28% of those 45-59 and 21% of those 60+ supported the stance. 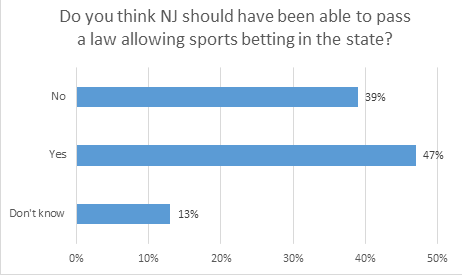 Similarly, addressing New Jersey’s attempt of recent years to allow for sports gambling, 61% of those 18-29 said they should have passed the law, while 50% of those 30-44, 47% of those 45-59 and 33% of those 60+ supported it. Daily fantasy games, a recent entry into the sports gambling discussion, attracts young people far more than older ones. While nationwide, only 15% say that have participated, the number is 24% for those 18-29, 11% for those 45-59, and only 6% for those 60+. 61% of all respondents believe those daily fantasy games are a form of gambling, with 23% calling them a game of skill. 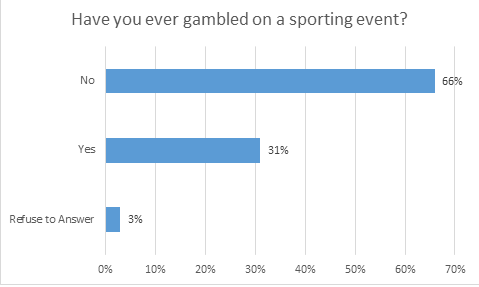 Asked “have you ever gambled on a sporting event?” 31% of all respondents said yes, 66% said no. This is in line with the same question, asked in November 2014, at which time 33% said yes, 67% no. A podcast in which Seth Everett interviews Rick Gentile will be available shortly. This poll was conducted by telephone February 20-22 among 626 adults in the United States. The Seton Hall Sports Poll is conducted by the Sharkey Institute. It’s been said a lot of people bet on sporting events anyway, so government should allow it and tax it. It’s also been said legal betting on sporting events is a bad idea because it promotes too much gambling and damages the integrity of sports. Which comes closer to your view? A while ago NBA Commissioner Adam Silver reversed the league’s historical stance and advocated legalized betting on sporting events on a strictly regulated basis. Do you think it’s appropriate for the leader of a major professional sports league to take such a stance? A few years ago, New Jersey passed a law allowing for sports gambling in the state. The major sports leagues and the NCAA successfully lobbied for an injunction to block the law because they said gambling on sporting events damaged the integrity of the game. Do you think New Jersey should have been able to pass a law allowing sports betting in the state? Four states (Nevada, Delaware, Montana and Oregon) are exempt from a federal law passed in 1992 that banned betting on sporting events. With which of the following statements do you agree? Do you think publishing point spreads in newspapers and on line encourages betting on sporting events? If gambling on sporting events was legalized do you think it should be regulated on a state-by-state basis or by the federal government? Have you ever gambled on a sporting event? If gambling on sporting events was legalized do you think you would place a bet? Commissioner Silver stated that gambling has become a popular form of entertainment in the United States. Do you agree or disagree? Baseball spring training has just begun in Florida and Arizona. Do you plan on participating in a baseball fantasy league this season? Have you ever participated in any of the daily fantasy games for any sports? Do you think participating in fantasy activities is a game of skill and therefore should be exempt from gambling laws or is it just another form of gambling? This entry was posted in Baseball, Baseball, Basketball, DFS, Fantasy Sports, Football, Gambling, General News, Sport and tagged Baseball, DFS, Draft Kings, FanDuel, Fantasy Sports, Gambling, MLB, NBA, NCAA Tournament Ban on DFS Ads, NFL, Poll Results, Seton Hall Sports Poll, Sharkey Institute on February 23, 2017 by Michael Ricciardelli. South Orange, NJ, February 13, 2017 – The American public feels that if an NFL team – presumably the Oakland Raiders – moved to Las Vegas, it would be okay with them, despite the city’s position as the center of legalized sports gambling. Asked in a Seton Hall Sports Poll last week how they felt about the Raiders possibly relocating there (in a publicly funded stadium), 40% said it was okay, 31% said it was not, and 29% undecided. The poll was conducted February 6-8 among 661 adults across the country on both landlines and cellphones, with a margin of error of 3.9 %. “I’m sure you wouldn’t get 31% saying no for any other city,” noted Rick Gentile, director of the poll, which is sponsored by The Sharkey Institute. “But a majority of those expressing an opinion still supports the concept despite no major league team having yet played a game there.” (The NHL is putting a team there next season). As for the public funding of a stadium, 75% felt the team should fund it with only 6% saying the public should fund it. This poll was conducted by telephone February 6-8 among 661 adults in the United States. The Seton Hall Sports Poll is conducted by the Sharkey Institute. Media: Media: Marty Appel Public Relations (212) 245-1772, AppelPR@gmail.com; Rick Gentile (917) 881-9489. The Oakland Raiders have announced they would like to move to Las Vegas and will play in a new stadium largely funded by the public. Do you think professional sports franchises should be making their home in Las Vegas considering it’s the sports gambling capital of the U.S.? Do you think the public should be funding stadiums and arenas to attract professional franchises or should these organizations pay for construction of their own stadiums? NHL Commissioner Gary Bettman has said he’s against the NHL participating in the 2018 Olympics unless the players agree to extend the current collective bargaining agreement. Do you think it’s appropriate to use participation in the Olympics as leverage in a labor negotiation? This entry was posted in Baseball, Basketball, Football, Gambling, General News, Poll Results, Sport and tagged 2018 Winter Olympics, Gambling, Gary Bettman, Hockey, Las Vegas, Las Vegas Raiders, MLB, NBA, NFL, NHL, Oakland Raiders, Olympics, Poll Results, Raiders, Seton Hall Sports Poll, Sharkey Institute, Stadium Funding, Vegas on February 13, 2017 by Michael Ricciardelli. South Orange, NJ, February 9, 2017 – An era of cord-cutting may loom in the future, but for now, traditional television viewing of the Super Bowl has a firm grasp on the American public. According to a Seton Hall Sports Poll conducted this week in the days after the game, a whopping 98% watched on TV, with only a combined 1% – barely – watching on phone, tablet or computer. 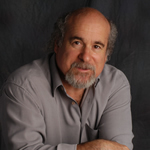 “It’s the biggest event of the year in America, and people want to watch it on their biggest and most reliable device,” noted Rick Gentile, director of the poll, which is sponsored by The Sharkey Institute. Meanwhile, asked if Tom Brady is the greatest quarterback in NFL history, 63% of those who identified as sports fans agreed with only 19% disagreeing. Of those who said they were NFL fans, 51% agreed, and 21% disagreed. Among the general population, 39% agreed, with only 21% disagreeing. “These are remarkably high numbers, given the controversies surrounding him – a large dislike for the New England Patriots, his suspension over ‘deflategate’ and his support of a controversial President,” said Gentile. 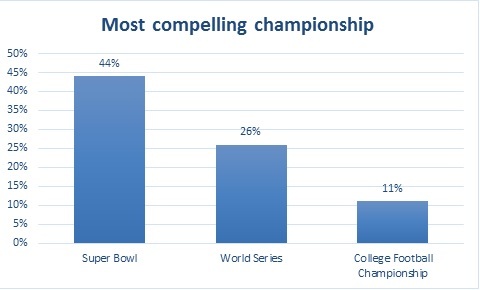 In the excitement following the first overtime in Super Bowl history and the fifth Super Bowl win for the Patriots, 44% found the game the most compelling of recent championships, with Game 7 of the World Series registering 26% and the college football championship (Alabama-Clemson) at 11%. “For the World Series to be named by one out of four Americans, three months after it ended and in the days after a thrilling Super Bowl is great news for baseball,” added Gentile. Asked if they saw any commercials during the game that made them want to purchase the advertised product, 83% said no, and 12% yes. 7% said they enjoyed the commercials the most, but 13% named the halftime show and 72% said “the game” when asked what they enjoyed the most. A commercial for GNC, the vitamin chain which sells substances banned by the NFL, was not shown. Asked whether GNC should have been allowed to advertise in the game, given that the banned products were not mentioned, 50% said yes they should have been allowed, with 23% saying no. 10% acknowledged wagering on the game (either through a bet, a pool or a fantasy league) and 84% said they had no wager on the game. 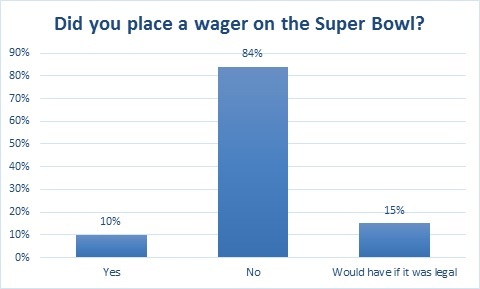 15% said they would have bet if wagering was legal. Did you watch the Super Bowl game on Sunday? What was the primary device you used to watch the game, a TV, phone, tablet or computer? Which did you enjoy more, the game, the halftime or the commercials? Did you see any commercials during the broadcast that made you want to purchase the product advertised? Did you place a bet on the outcome of the game, participate in a pool, engage in fantasy play or not wager any money on the game? If sports gambling was legal in your state would you have placed a bet on the game? Bowl. Do you agree, disagree or are you not sure? GNC, a maker of dietary supplements, was forced by the NFL to withdraw its commercial from the Super Bowl because it makes some products that NFL players are banned from taking. No mention of the banned products occurred in the commercial. Do you think GNC should have been allowed to advertise in the game given that the banned products were not mentioned? Which event did you think was more compelling, the Super Bowl, the college football championship or the 7th game of the World Series? Do you consider yourself a fan of NFL football? This entry was posted in Advertising, Baseball, Baseball, College, Football, Gambling, General News, Level, Media, Poll Results, Professional, Sport and tagged Advertising, Baseball, DFS, Football, Gambling, GNC Super Bowl Ad, MLB, NFL, Poll Results, Seton Hall Sports Poll, Sharkey Institute, Sports Gambling, Super Bowl, Tom Brady, Tom Brady Greatest Quarterback, World Series on February 9, 2017 by Michael Ricciardelli.